I had a fun Saturday, getting reacquainted with my machine after two weeks away (a long time in my books!). Josh was away too, so I stuck some catch-up TV on and had a little silk sewalong. 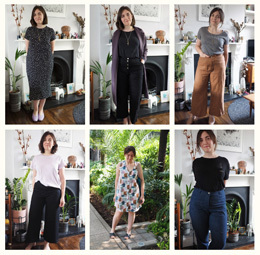 I’ve just started a new work contract which is vaguely in the fashion industry, so my mission was make some slightly smarter yet still comfy tops. 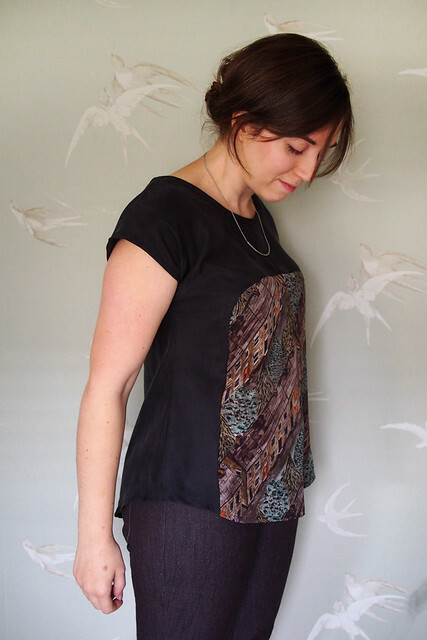 Enter some lush fabrics and two brilliant little patterns: a BHL Polly-Anna lovechild, and True Bias’s brand new Sutton Blouse. 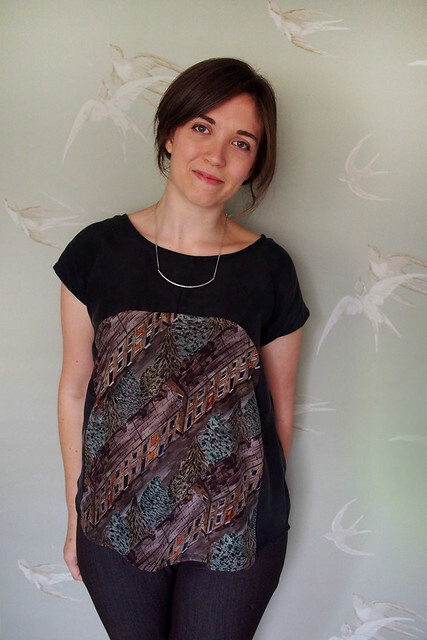 I was inspired by the current BHL #Patternhackathon contest to have a go at mashing together the the Polly top and the Anna dress to make an autumn-appropriate top. It’s a Pollyanna! – that name reminds me of that horrendous film that’s regurgitated every Christmas, but I suppose it’s too good not to use. Hacking the patterns together was very straightforward. 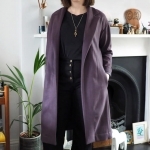 I simply laid the Anna over the Polly, lining up at the neck edge and along the shoulder line, and drew Anna’s extended kimono sleeve and underarm curve straight onto the Polly. I also copied over Anna’s lovely neckline. 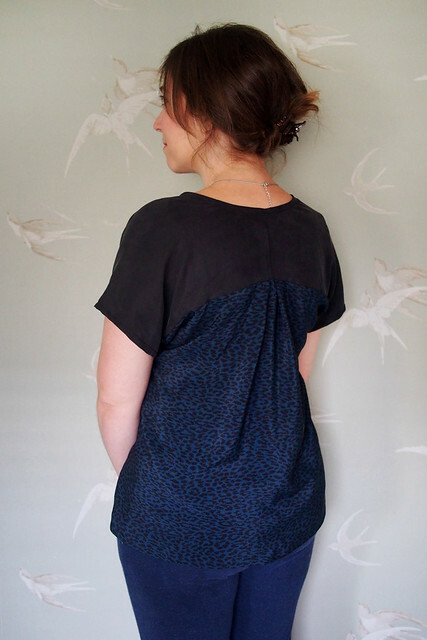 The main fabric is a black sandwashed silk from Goldhawk Road, with the dull side facing out. 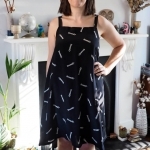 I love how it looks and feels, but it was kind of a pain to work with because the rough surface doesn’t feed through the machine that easily – I had a few skipped stitches and ripply seams to deal with. The front panel is a beautiful printed lightweight silk that I actually bought the same day at a local Peter Jensen sample sale which Kathryn and I popped along to in the morning. The Polly pattern piece just fitted onto the little scrappy remnant, so it was clearly meant to be. I can’t get over how well it fits: I suppose it makes sense since I’d already tweaked both patterns to fit me, but I absolutely love them together. The guts are just as pretty: you gotta do french seams, narrow double-turned hems and self-bias necklines when working with a sumptuous silk. Only the curved panel seam is overlocked, but I bet you could french seam that too if you were feeling brave. Fingers crossed for the competition – there’s a heck of a prize hamper at stake, I hear. 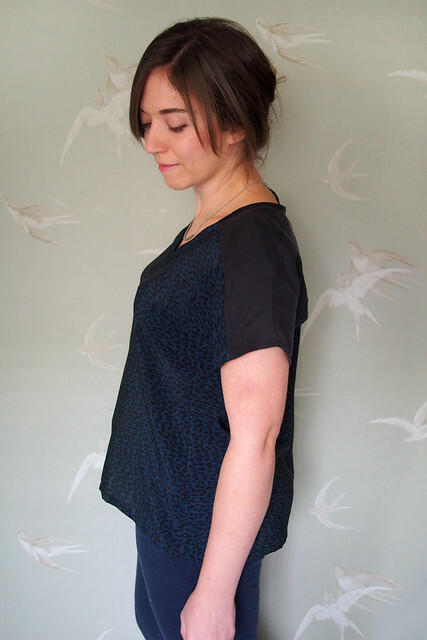 My second make of the day was the True Bias Sutton blouse. Kelli asked me to test the pattern but the dates fell over when I was away in Mexico. I was so disappointed because I loved the design at first sight, so Kelli very kindly sent me over the finished pattern anyway. Yeah, I’m wearing it with my Hudsons, not that they really go together but I couldn’t resist. I used the last scraps of the sandwashed silk for the all-in-one shoulder yoke, and another silk that I got from a House of Hackney sample sale for the main. Again it was a small remnant that the pieces only just fitted onto, and then only if I cut on the crossgrain hence the sideways leopard print. I do get an odd sense of achievement from fitting a pattern onto the scrappiest of scraps. The pattern came together really easily. The instructions are great and I made no fit adjustments, just grading from a 6 at the top to an 8 at the hip. I love the technique for finishing the front V-neck nice and precisely, and you’re instructed to use French seams throughout for a swish finish. The only design tweak I made was to leave off the side splits and level off the hem so that I could French the side seams too. 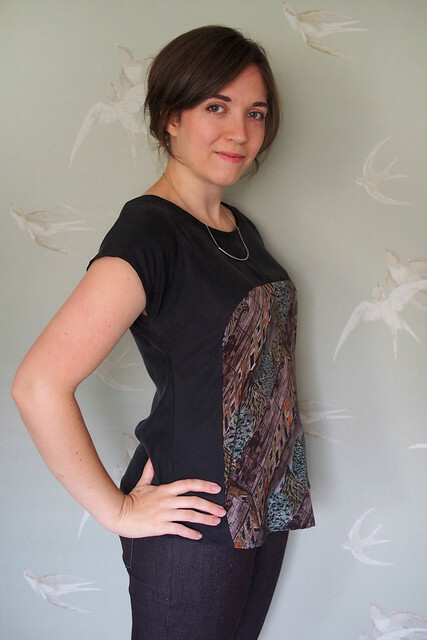 I’m pretty sure I’ll make both of these tops again – just keep me rolling in fancy silk! these look great! i love the fabric blocking that you did on both. so glad that you liked the pattern! Congrats on your new job in the fashion industry! Should prove to be rather exciting for a sewist. And, your Pollyanna, heh, heh (Did you read the books or see the movie? ), good name and looks terrific. Doesn’t silk just elevate everything into luxurious territory? It so does, yet it’s so easy to wear and care for too. Dream fabric! I’d love to see another Pollyanna, I can see it on you already! Whoa your Pollyanna is gorgeous. What an inspired idea. 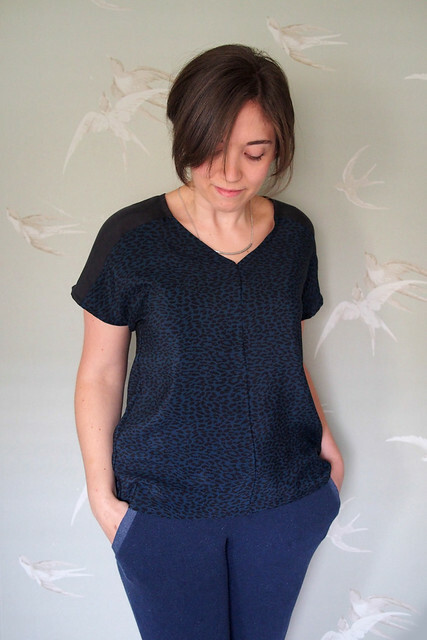 Pretty much my favourite shape in a woven top!! Please do, I’d love to see more! These both turned out so well! I totally agree that silk makes one feel instantly more fashionable. 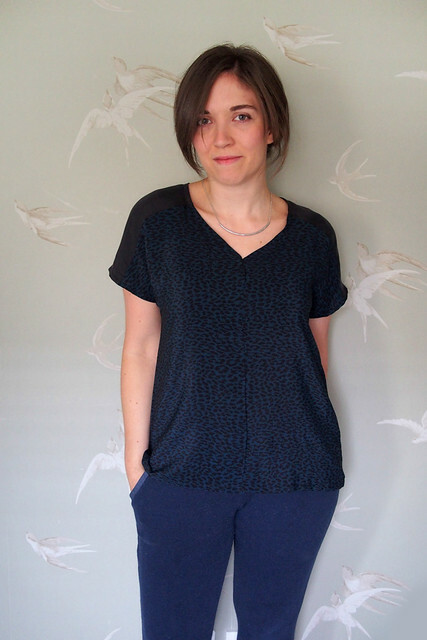 :) Also have to admit that I had never been drawn to the Polly top until this variation- color choice, fiber choice and hack all created the perfect storm here! Well done. 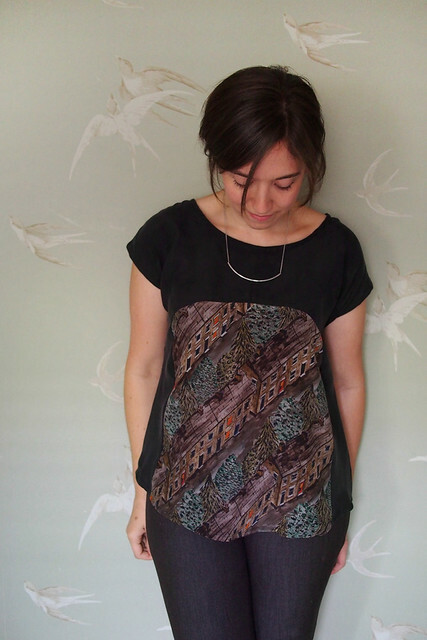 I’m fond of any pattern that has scope for colour-blocking tbh ;) Plus it’s free – winner! oh i love the polly so much more as a pollyanna! these are both great, i have a weakness for silk tees also. so luxe! I was all on the fence over polly but now I’ve seen pollyanna I’m sold. You clever thing!! Bwahahahah I spelt my own name wrong! Lovely to meet you last night! I totally failed to realise your top had terraced houses on it. That’s the best! You too Rosie, thanks for stopping by! These are so gorgeous! 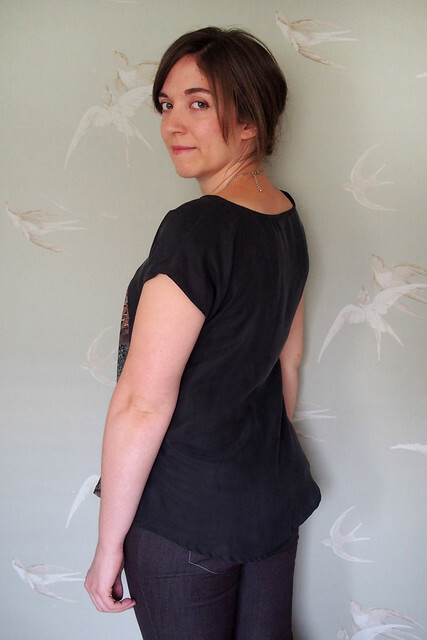 I love the Pollyanna—such a clever idea, and the shape is so lovely on you! My list of things to make “right now” is SO HUGE but the Sutton and a pollyanna have just been added. I need more arms / clones of myself / more hours in a day? All three? Yes please. Lovely work! I need to make a Pollyanna and find the time for a Sutton. Thanks for the inspiration!